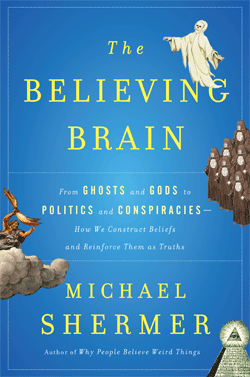 On Saturday, November 3, 2012 I spoke at the big atheists’ conference in Mexico City on The Believing Brain, my latest book in which I develop a theory to explain not just why people believe weird things, but why people believe anything at all, including and especially god beliefs. (I don’t know if the talk will be posted Online but it is an expanded version of my TED talk or this longer version. While I respect Shermer’s view that invoking aliens or some unknown explanation avoids a “god of the gaps” argument for unknown and miraculous or divine phenomena, I still feel as a scientist that the existence of a true supernatural god is a theoretical possibility, and that there is some possible evidence that could convince me of it. (I’ve described that evidence before; needless to say, none has been found.) Yes, such miraculous evidence for a god might eventually be found to be due to aliens or the like, but my acceptance of a god would always be a provisional one, subject to revision upon further evidence. (We might find aliens behind the whole thing.) After all, every scientific “truth” is provisional. God 2.0: Is the deity a nonlocal quantum mind? I have debated many a theologian who make the traditional arguments for God’s existence: the cosmological argument (prime mover, first cause), the teleological argument (the universe’s order and design), the ontological argument (if it is logically possible for God to exist then God exists), the anthropic argument (the fine-tuned characteristics of nature), the moral argument (awareness of right and wrong), and others. These are all reasons to believe if you already believe; if you do not already believe these reasons ring hollow and have been refuted by philosophers from David Hume to Daniel Dennett. Cartoonist Sidney Harris once illustrated two scientists at a chalkboard. One has written, among mathematical equations, “Then a miracle occurs,” to which his colleague replies, “I think you need to be more specific here in step two.” This nicely sums up the relationship between science and religion: one deals in the natural while the other deals in the supernatural. And never the twain shall meet. It’s a very weird time of year for the non-religious skeptic. Everyone is going to church, talk of Jesus and God abound and the holiday discussion is centered around whether we should say Happy Holidays or Merry Christmas. I didn’t grow up in a very religious home. My parents allowed me to make my own decision about religion. I went to bible school a few times when I was a child during summer. I even attended a Christian private school from pre-school to 1st grade. My only recollection of that experience is that the staff was scary and that I had to memorize verses every week. How that relates to a good education, I still have no idea. My parents, thankfully, figured this out quickly and put me into public school, where I really learned a lot and could grow up to be a well-rounded, healthy person. Religion is such a sensitive subject, I even thought twice about whether I wanted to write anything on the net that talks about religion, and my views of it. I know there are friends that I have that are very religious, that may read this. Generally, I just avoid that subject with them, because most of the time, I have no desire to discuss or quarrel with them on my religious views. My friendship is more important that one aspect of their lives not aligning with mine.